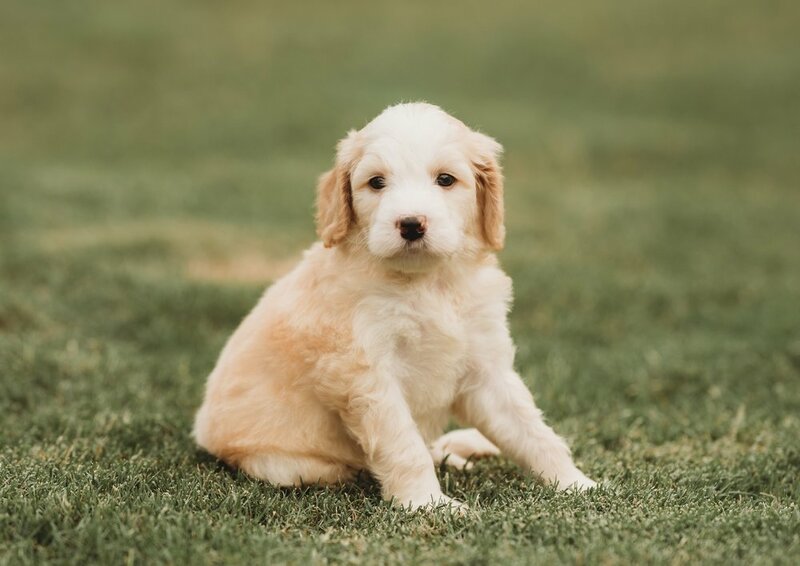 Best Bernedoodle Breeders specializes in outstanding tricolor and bicolor Bernedoodle and mini Bernedoodle puppies for sale. Affectionate, calm, loyal, devoted: These are a few words that families use to describe their Bernedoodles. 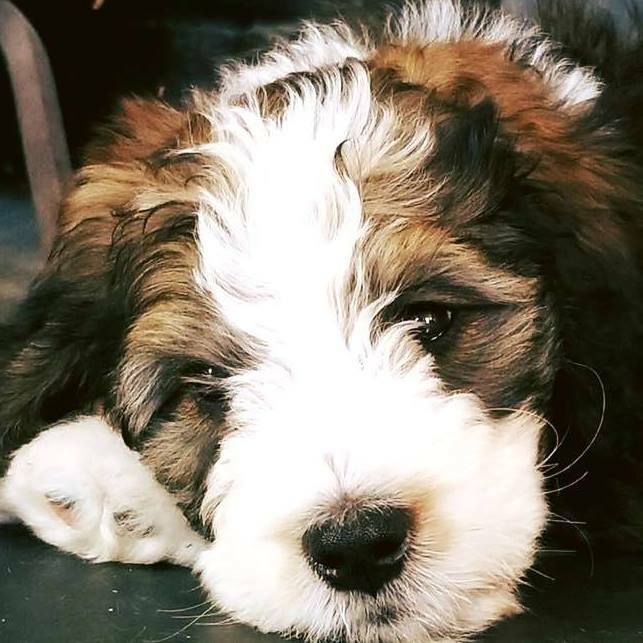 We strive to be the best Bernedoodle and mini Bernedoodle breeders providing good-fit families with occasional pups of outstanding health, temperament, and looks. Based in Greenville, SC; we also have Bernedoodle families in our network in Detroit, MI, Allentown, PA, and San Francisco, CA. Why cross a Poodle with a Bernese Mountain Dog? Both Labradoodles and Bernedoodles are usually excellent with kids. Labradoodles and Bernedoodles have hybrid vigor working in their favor. Hybrid Vigor comes from crossing two diverse gene pools (Poodle + Bernese). Often the doodle puppy (Bernese/Poodle) has considerably fewer health issues than either parent breed would have. As humans we never marry close relatives for similar reasons. We never ship puppies as we think it provides a terrible start. 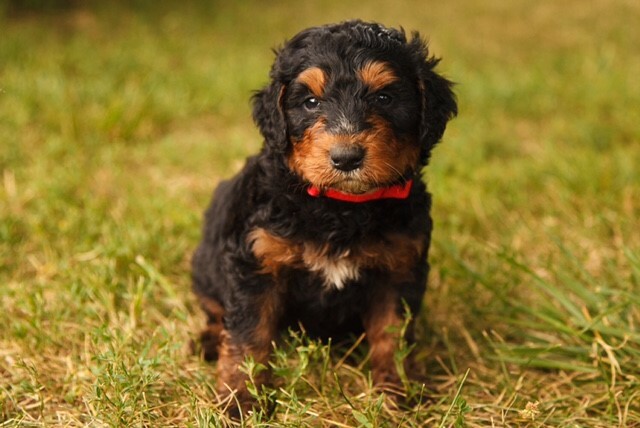 We have people from all over the U.S. (and Canada) drive to one of our pick up homes to get a Bernedoodle puppy; fly to us and fly back with the pup in the passenger compartment, or have us hand deliver their pup for 60 cents a mile. Bernese Mountain Dogs (BMD) are outstanding dogs! Why would anyone consider getting something different. The reasons below explain why Bernedoodles are becoming in much higher demand (and more expensive) than purebred BMDs. Bernedoodles usually shed less or not at all. Families with allergies often get along famously with Bernedoodles and mini Bernedoodles, but would have problems with the heavy shedding of the Bernese. Hybrid vigor (see explanation in the column to the left) works strongly in the favor of the Bernedoodle. Many Bernedoodle owners are finding nearly double the lifespan for the Bernedoodle vs the Bernese Mountain Dog. Poodles tend to be a healthy breed with very few hip issues. Of course any dog can have problems, but in general, the Bernedoodles are proving to be much healthier with extended lifespans. Poodles are known as the smartest or second smartest breed in the dog world. Bernese are sometimes known for being clowns or not super quick learners. In general Bernedoodles are easier to train and demonstrate greater intelligence than purebred Bernese Mountain Dogs. Bernedoodles are usually better travelers. This is not always the case, but it's typically easier to travel with a Bernedoodle than a Bernese. Less shedding, less bulk, and greater intelligence help with travels. Bernedoodles are available in more colors. Bernedoodles are available in a miniature size. Bernedoodles are usually better in the water. Not quite as water-loving as a Labradoodle, Bernedoodles still tend to like the water more than a pure Bernese. 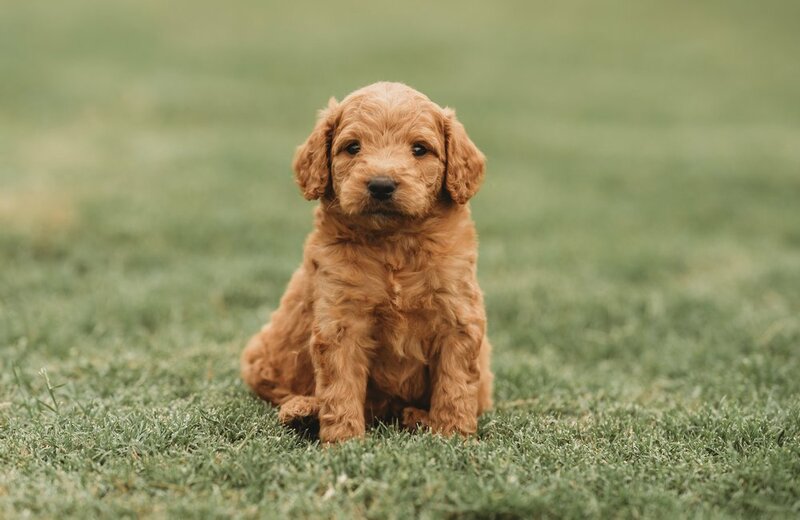 The fact that poodles were originally bred as water retrievers bodes well for Bernedoodle owners who live on a lake or the ocean. Many people desire a Bernedoodle, simply because they SAW one. After falling in love with the looks they find out about hypoallergenic, health, intelligence, etc. But the undeniable fact is that many Bernedoodles are beautiful dogs. Properly bred Bernedoodles tend to be loyal and less hyper than some doodle breeds. Good Bernedoodles (like well-bred Bernese) are great companions. You might even see a Bernedoodle pulling his owner's wagon or garden cart at times. Hybrid vigor greatly helps the overall health of a Bernedoodle compared to a Bernese mountain dog. Many purebred Bernese (especially the American breed) are averaging only 6-7 years for their lifespan. Families are reporting that their Bernedoodles are living 11-14 years; basically double the lifespan of an AKC Bernese Mountain Dog. 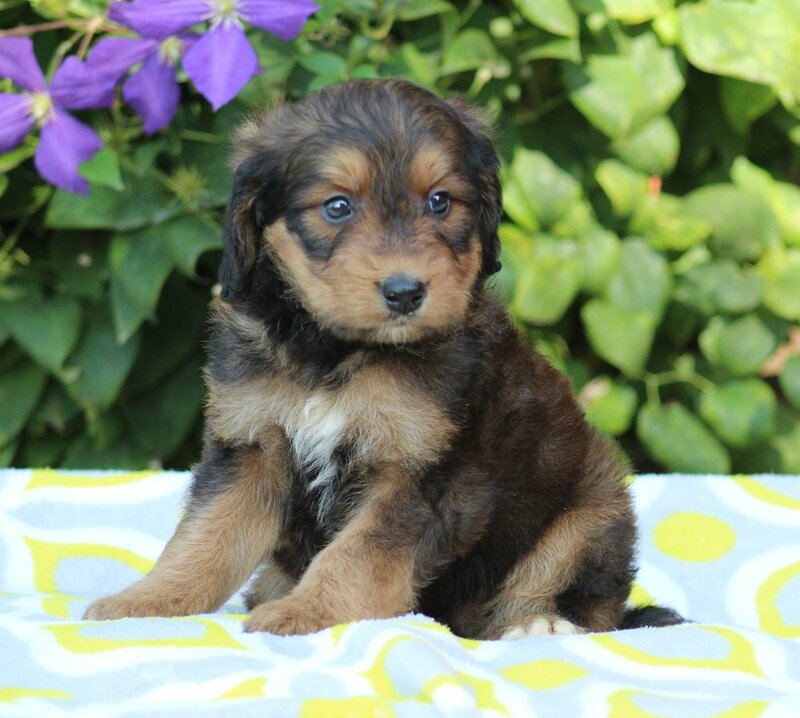 Matches Bernedoodle and mini Bernedoodle pups of oustanding health, temperament, and looks to great-fit families.